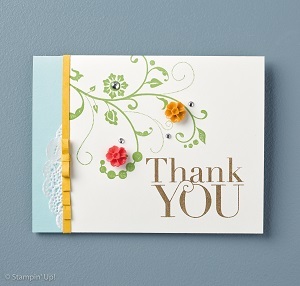 Have you noticed all of the great examples Stampin' Up! has in the catalog? I sure have and oh how I would love to make each and everyone of their examples! Your catalogs can be a great place to get ideas when the creative bug just isn't biting but you want to make a card or a project because you just love to make things or maybe you need a card for an occasion...fear not...head for your catalog and pour through the pages until something strikes your fancy and CASE it...Copy and Share Everything. You see, paper crafters LOVE to share everything. So this is an example of casing. 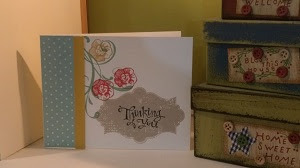 You can CASE a card exactly or you can take the overall design elements and change up the stamps papers and embelishments to make it more your own. Do what makes you happy and enjoy creating and never fear, when the creative juices just aren't flowing, look to your catalog for all sorts of wonderful ideas!